Goodman Masson are working with a global insurance company who are searching for a Head of Risk. You will lead their second line defence for their London market business, currently worth just short of £1bn in GWP and growing at double-digit rate. You will be focusing on their global corporate clients predominantly focused on commercial property, however they are also growing rapidly in the specialty lines space. 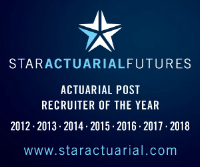 They are looking for a Qualified Actuary to take on this role. They want someone who has a well-rounded knowledge of the London market and has previous experience in Capital and Risk. They are looking for someone who will be able to communicate to senior stakeholders and understand business transactions, the risk associated with them and can influence the decision-making process. Day to day you will be leading the 2nd line function of their global corporate business. Your work will be wide in scope; advising on deals, underwriting facilities, major reinsurance programmes, product changes and geographical expansions to name but a few. It's a broad and challenging role in a growing business area, one that should excite someone that is interested in this field.